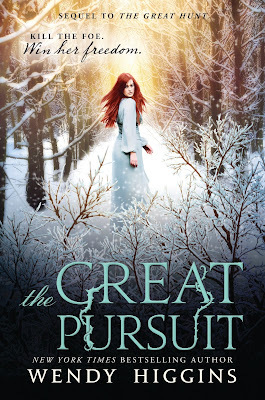 In The Great Pursuit, the dramatic sequel to the New York Times bestselling The Great Hunt, Wendy Higgins delivers another thrilling fantasy filled with dangerous enemies, political intrigue, searing romance, and a princess who is willing to do everything to protect her kingdom. One hunt has ended, but the pursuit for love and justice continues. The kingdom of Lochlanach has traded the great beast that once terrorized the realm of Eurona for something far more dangerous: the ire of powerful Lashed woman Rosaria Rocato. Rosaria demands that Eurona overturn the laws prohibiting magic, or an innocent will be killed each day. Despite the king’s resistance, Princess Aerity believes they must make peace with the Lashed, and though she’s accepted a betrothal to the man who took down the beast, she cannot help thinking about Paxton, the Lashed man who stole her heart and disappeared. Aerity soon discovers that Paxton has joined Rosaria’s army in the war against her family. Though her feelings for him are still strong, her duty to her kingdom and her family is stronger—especially when her parents are kidnapped and she has to step up to the throne and once again put aside what’s best for her in order to do what’s best for her people. Paxton and Princess Aerity must fight to see what is more powerful: their love or the impending war between the magical Lashed and the non-magic humans. Grab the eBook 1 THE GREAT HUNT for just $1.99! A new beast roamed the kingdom of Lochlanach, killing at will. A second unnatural monster created by the hands of Rozaria Rocato, granddaughter of the most infamous and hated Lashed One of all time. Princess Aerity Lochson’s mind was a blur of piled-up worries as she rushed from High Hall of the castle, away from the frightened commoners and guests who’d come for her betrothal ceremony, and toward the office of her father, King Charles. She turned at the sound of heavy footsteps behind her and found both her childhood friend Lieutenant Harrison Gillfin and her betrothed, Lord Lief Alvi, following. Lord Alvi looked every bit the hero—his broad stature striking, with elk furs about his shoulders and a black kilt to his knees above leather boots. His blue eyes were filled with bright passion and hunger, but those emotions were not for her. They were for the beast. The new hunt. He had killed the first creature, thereby earning her hand in marriage. The thought twisted Aerity’s stomach with discomfort and turned her mind to the man who’d disappeared weeks before when the beast was killed—the Lashed man who’d taken her heart with him and would likely never return. She clenched her jaw. This was no time to think of Paxton Seabolt or her drowned desires. The kingdom was suffering again—rendering everything she’d sacrificed to have been in vain. Her eyes shifted from Lord Alvi’s to Harrison’s and found a fierce, protective comfort there. Harrison stood tall, lean, and capable. Never faltering. The thought of her noble friend fighting yet another beast filled her with sharp fear. So many lives had already been lost, including Harrison’s cousin Breckon, who’d been the true love of Aerity’s cousin Wyneth. Half a year was all it had taken to trample the dreams and futures of so many. Aerity gave the men a nod to follow her. She lifted her long white skirts and moved quickly down the tapestry-lined hallway to her father’s office. Guards and soldiers ran past, shouting orders, fully armed with bows, swords, and lines of throwing daggers strapped across their uniformed tunics. She opened the door without knocking. No fewer than twenty faces shot toward her. She recognized the burgundy red hair of her mother, along with her aunts and uncles, military elite, and royal advisers. Her father invited them in with a quick flick of his fingers. “Your daughter gave a rousing speech,” Lord Alvi pro- claimed in his rumbling voice. “She is to thank for the calm.” Aerity’s face flushed with heat at the unexpected compliment. Then he put a heavy hand on her shoulder and pulled her close. Aerity fought the urge to shrug away. For the sake of the kingdom, she had made a commitment to become his bride, and she would follow through regardless of what her heart wanted, and regardless of the fact that she was certain feelings had grown between Lief and Wyneth. “Did she?” The king’s eyes softened with pride, and her mother, Queen Leighlane, smiled at Aerity and Lief, no doubt thinking what a lovely couple they were. If she only knew. King Charles nodded, his face lined with anxiety. “Aye. But most of the hunters have dispersed.” Or been killed, Aerity thought with sorrow, remembering the men who’d come from all over Eurona and even a huntress who’d lost her life. Aerity’s abdomen tightened. Tiern was Paxton’s younger brother. He’d nearly been killed by the first beast and had been saved by Paxton’s Lashed magic. It was the very reason Pax had fled the kingdom—using magic was illegal, even to heal. Aerity didn’t want Tiern to hunt again. She didn’t want Paxton’s sacrifice to have been a waste. “And his older brother?” the king asked. “He’s the same age as you, Daughter,” the king reminded her. “Seventeen. A man who’s already proven himself in the hunt.” Aerity pressed her lips together and nodded. She could not keep Tiern safe any more than she could force Harrison to stay out of harm’s reach. Their heroic hearts would urge them forward. “Can we send word to the Zandalee?” Aerity’s uncle Lord Wavecrest asked. A fearful silence fell over the room. Each kingdom was on its own with its own beasts to battle now. Lochlanach was a quaint kingdom of fishermen and crop villagers, farmers, that had enjoyed many years of peace. The people had risen together to fight the first beast, but how much more could the king expect from them? It was too much. To imagine this kind of horror inflicted on innocent people all over Eurona sickened Aerity. “Perhaps another proclamation?” Lord Wavecrest suggested carefully. At this proposal from Aerity’s uncle, the men in the room glanced around at one another, and the hairs rose on the princess’s arms. The queen caught her daughter’s eyes, and they both went still. The last proclamation had offered Aerity’s hand in marriage to whoever killed the beast. The only thing left to give was the second princess, Aerity’s fifteen-year-old sister, Vixie. Her father stared down at his desk. The king’s hazel eyes, filled with regret, rose to hers. “I have nothing left to give.” With Vixie’s hand would come her dowry of lands. Using Vixie as a prize would surely smother her soul. Aerity wouldn’t stand for it. Aerity stilled, forcing back the torrent of words that flooded her mind: unfair, poor match, confinement, no joy, no love. She was to endure those things for her kingdom, but the thought of Vixie losing her freedom to choose her future . . . it gutted Aerity. She knew how it appeared to the world—that she’d landed a handsome, noble, brave lord—but the heart didn’t care about appearances. It wanted who it wanted. “Enough, Aerity,” Queen Leighlane said quietly. Aerity met her mother’s eyes and felt an understanding there. No one knew better than the two of them how this would crush Vixie’s spirit. These men couldn’t possibly understand. “Vixie’s nearly sixteen,” Lord Wavecrest pressed. Aerity wanted to claw out his eyes and force him to stop speaking. Lord Wavecrest shook his head and crossed his arms. Aerity breathed a temporary sigh of relief. “Sire, we should address the other part of the Rocato woman’s letter.” This was from the king’s oldest adviser, Duke Gulfton. This duke had been the closest adviser to Aerity’s grandfather King Leon. His views on the Lashed were legendarily conservative and strict, and he was a proponent of keeping the Lashed lists up to date. All persons with Lashed capabilities and their families were notated in the records and checked regularly for markings. A few of the other older men murmured their agreement. Thousands of persons with Lashed blood in Lochlanach. Amazing, Aerity thought. Only a small percentage of those on the list actually had magic, though. Paxton’s family was not on the list. Aerity wondered how many others of magical blood had been able to elude the system. “Here, here!” a few men shouted, as if it were that simple. As if they wouldn’t have done it by now if they could. The room quieted and a sense of unease spread as heads turned and everyone eyed the others present. Her father’s council was a small group of family and a mere handful of wise advisers, all landowners, who’d been loyal to the kingdom since her grandfather ruled. She couldn’t imagine this group being compromised. “You’ll have to work faster this time,” Duke Gulfton told them. The room tensed. During the last hunt they’d had a hundred men. They’d sought the monster nearly ten hours a night and spent the days scouting and preparing. The lands of Lochlanach stretched far and wide. Yet people like Duke Gulfton were expecting a miracle of the sea. Magic that wasn’t all bad, Aerity thought. Magic that had saved Tiern and could save others. If only she could get them to embrace that. Aerity rushed on. “I don’t believe all Lashed are ‘her people.’ The entire area would be heavily guarded so that if any Lashed got out of line, they could be dealt with immediately.” The old dukes scoffed at her. The room broke out into fervent debate. Those who were against Aerity’s idea were adamant, passionate in their fears. Those in favor seemed on weak, shaky ground. Aerity felt a hand on her shoulder and turned to see Harrison, his light brown eyes showing the never-faltering respect he seemed to hold for her. She gave his hand a quick squeeze of gratitude before he released her. Aerity caught Lord Alvi watching the exchange with curiosity, so she turned her gaze forward again—she would let him think what he wanted. Without another word, the king swept from the room with Queen Leighlane and a line of advisers close behind. “As I recall,” Aerity said steadily, “Mrs. Rathbrook healed your ailing heart last year.” Mrs. Rathbrook was the royal healer—the only Lashed allowed to work magic. 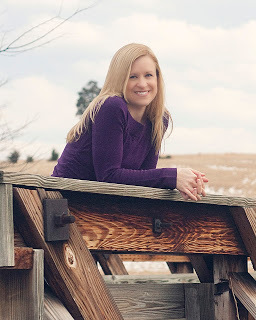 Wendy Higgins is the USA Today and NYT bestselling author of the Sweet Evil series from HarperTeen, the high fantasy duology The Great Hunt, and her independently published Irish fantasy, See Me. She is a former high school English teacher who now writes full time, and lives on the Eastern Shore of Virginia with her veterinarian husband, daughter, son, and doggie Rue. Wendy earned a bachelor's in Creative Writing from George Mason University and a master's in Curriculum and Instruction from Radford University. She is represented by Jill Corcoran of the Jill Corcoran Literary Agency. (2) Winners will receive the grand prizes (The Great Hunt Paperback and The Great Pursuit hardback from HarperTeen, and signed swag from Wendy Higgins! Plus an ARC of ROAR by Cora Carmack! ), US Only. (5) Winners will receive signed sets of swag - International!